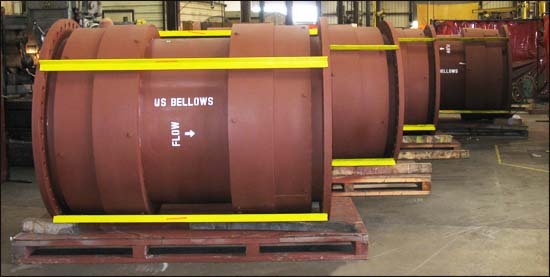 PT&P designed and fabricated 48″ universal expansion joints for a refinery. The bellows and flow liner are 316 stainless steel, while the rest of the expansion joint is carbon steel. These expansion joints are capable of 5.3″ axial compression, 2.0″ lateral, and 5° of angular movement. They are designed to operate at 25 PSIG with temperatures up to 150°F. A hydro-test and X-ray test was performed prior to shipment.